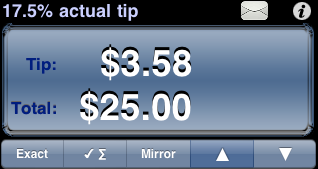 This app offers a variety of tip calculation methods, including exact, checksum, palindrome (aka mirror), and rounded up or down. These different methods are selected from the bottom buttons. 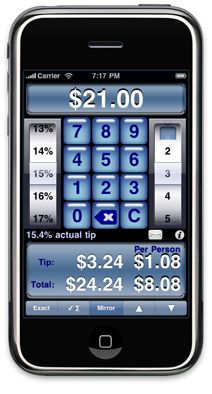 The tip calculation methods can be applied to either the check total or the per-person total. By default, the tip calculation method will be applied to the check total. To switch the target to the per-person total, swipe your finger from the left to the right across the results area. To switch the target back to the check total, swipe your finger from the right to the left. When the Exact tip calculation method is selected and the check is not being split, then the tip amount will equal (the selected tip percentage × the pre- or post-tax subtotal amount), rounded to the nearest $0.01, or 1/100th of your native currency. This tip amount is known as the exact tip amount. The exact tip amount + the subtotal amount equals the exact check total. These two values are used in the calculations for checksum, palindrome, and rounded up/down. For more information about using the pre- or post-tax subtotal amount, see the Sales Tax section. If the number of people by which to split the check is greater than one, then the total amount per person and tip amount per person are calculated by dividing the exact check total and exact tip total by the number of guests, respectively. Finally, the check total and tip total is calculated by multiplying the number of guests by the per-person total and per-person tip amount, respectively. In situations where the exact check total is not evenly divisible by the number of guests, the final check total might be greater than the exact check total by as much as $0.01, or 1/100th of your native currency, per guest. Please refer to the Splitting section for more information. The checksum is a popular technique in the fight against tip fraud. Adjusting your tip to embed a checksum makes it easer to identify amounts that have been altered. This app adjusts the amount of the exact tip amount (see Exact) so that the last digit in the sum of the numbers total to the left of the decimal separator equals the right-most digit to the right of the decimal separator. 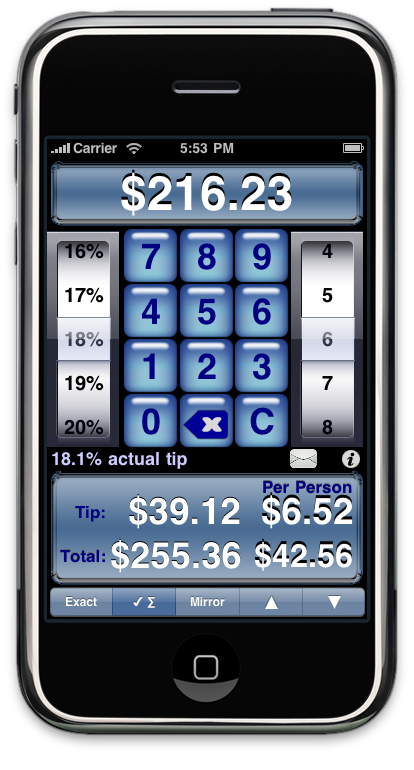 In our tip fraud example, the original total ($53.49) has "53" to the left of the decimal separator. 5 + 3 = 8, so the final digit to the right of the decimal separator should be eight instead of nine. To embed the checksum, the total can be adjusted to $53.58 or $53.48 by adding nine cents or subtracting one cents from the tip amount. We do not believe in under tipping, so this app will add cents to the tip as long as the amount added does not increase the dollar amount, which would then force a recalculation of the checksum. If adding cents to the tip will increase the dollar amount, then cents are subtracted from the tip in order to achieve the checksum total. 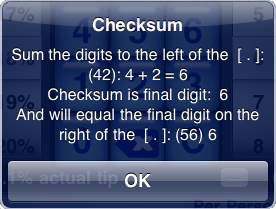 The checksum methods can be applied to either the check total or the per-person total. By default, the tip calculation method will be applied to the check total. To switch the target to the per-person total, swipe your finger from the left to the right across the results area. To switch the target back to the check total, swipe your finger from the right to the left. Double tapping in the results area at the bottom of the display will bring up an alert that explains the checksum. Please refer to the Splitting section for more information. A palindrome is a word, line, verse, number, sentence, etc., reading the same backward as forward ("palindrome." Dictionary.com Unabridged (v 1.1). Random House, Inc. 28 May. 2009.). Palindromes provide another method of combating tip fraud because, like the checksum method, they make it easier to spot modified amounts on a credit card statement. It is arguably easier to recognize a palindrome amount than a checksum amount on a credit card statement, but it is also easier for the disgruntled server to notice the palindrome and modify the tip amount to create a more expensive palindrome. By default, the palindrome will be applied to the check total. To switch the target to the per-person total, swipe your finger from the left to the right across the results area. To switch the target back to the check total, swipe your finger from the right to the left. Selecting the round up or round down buttons will round the check total or per-person total, depending on the selected target, up or down to the nearest dollar, respectively. If "round down" will cause the check total to be less than subtotal amount of the bill, then "N/A" will be displayed. By default, the check total will be rounded. To round the per-person total, swipe your finger from the left to the right across the results area. To switch the target back to the check total, swipe your finger from the right to the left.